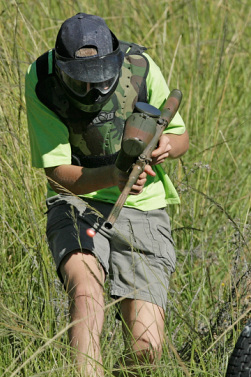 Paintball is one of the fastest growing activities in South Africa. Skulls Paintball guarantees an awesome paintball experience to young and old. We were never in doubt that we wanted to create the most unique and exciting paintball experience in South Africa. That is what we set out to do. From the design of the field to the equipment on offer is in line with this vision. If you are organising a bachelors, a bachelorette, a team building, a birthday party or just a fun day with friends, you have come to the right place. This is especially true if you are looking for something to do while on holiday in Bela-Bela or surrounding areas. This is the home of holiday fun for everyone! For more up-to-date info you may visit us on our Facebook Page and if you have any photos to share of your group playing paintball or just hitting a pose we would love you to upload and tag them. If you are new to the game or just want to know a little more, have a look at our Paintball 101 page. We are able to handle very large groups and the minimum is 4 players. We recommend 10 players or more. We also make the field and equipment available to charities wanting to host events - just get in contact with us! For more information about booking for large groups, have a look at our Prices. A shop caters for all your refreshment needs - biltong, chips and cold drinks. You are welcome to bring along your own refreshments as well if you prefer. You can also have a braai on the premises with prior arrangement. We can offer accommodation for up to six guests in a farm cottage near the paintball. The unit is air conditioned, has a swimming pool and braai facilities. For more information, have a look at Dinkelacker. We are proudly associated with CryWolf Entertainment - a gigantic scale paintball in Centurion, Pretoria.